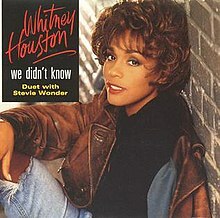 (1992) "I Will Always Love You"
"We Didn't Know" is a mid-tempo duet by American recording artists Whitney Houston and Stevie Wonder, and was released as the sixth and final single from Houston's third album I'm Your Baby Tonight (1990). The single peaked at number 20 on Billboard's R&B Singles chart. There was no music video made for the song. The song is about two good friends that realize that they have romantic feelings for each other and are more than just friends — they love each other, and they "didn't know." Houston and Wonder performed the song on an episode of The Arsenio Hall Show in November 1990. Rolling Stone adored the song and praised it with a long review: "Still, the key to the kind of music Houston sings on I'm Your Baby Tonight — the black-and-white, funk-and-dance-driven pop that is the soundtrack of this cultural moment — is "We Didn't Know," Houston's duet with producer Stevie Wonder. Wonder, who practically invented the keyboard-based pop that Houston and her fans hear as natural and contemporary, understands Houston totally. He knows what she likes about the expressive properties of ballads, about the passion of rock, about the well-regulated technological zing of dance music. So, as he's done before in his own music and with other singers, he puts all of this — the barreling rhythm tracks, the soaring choruses, the personable background voices — at the service of "We Didn't Know," which is about when "innocent friends/Turn serious lovers." Chances are — and with any luck — this emotionally engaged song on Whitney Houston's consistent and resourceful album will affect the music she sings for the rest of her life." Entertainment Weekly's David Browne called the song "sluggish" and that this contribution "blends into the mush." J. D. Considine of The Baltimore Sun wrote: "We Didn't Know," in which Houston merely follows the lead of duet partner Stevie Wonder, also has its pleasures, most of which stem from Wonder's deliciously idiosyncratic writing." ^ "Whitney Houston Chart History (Hot R&B/Hip-Hop Songs)". Billboard. This page was last edited on 2 April 2019, at 07:24 (UTC).